Transition Town Guildford recently incorporated and has also commissioned a swish new logo. We are therefore embarking on an interesting new phase of official membership, neighbourliness and member activities and benefits! 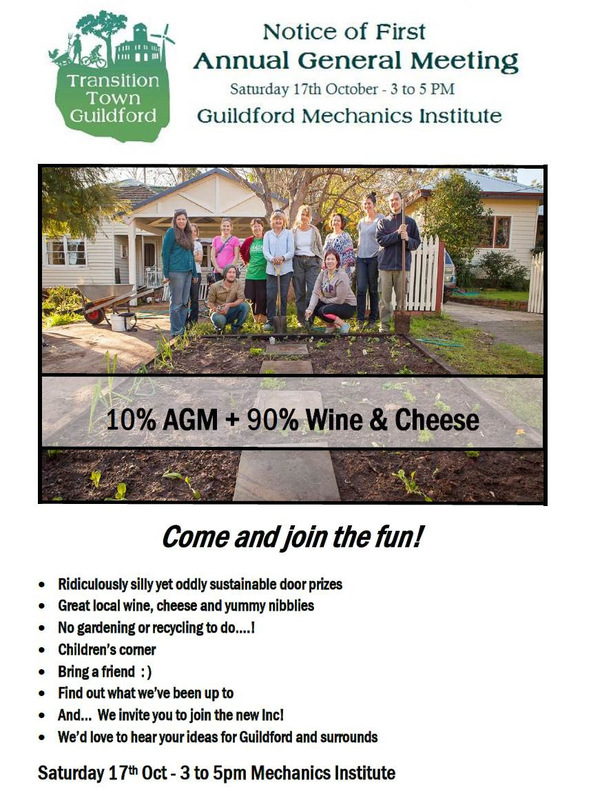 The first of these is our official AGM accompanied by local wine, local cheese and… some friendly locals. We hope you will join us to celebrate, to find out what we’ve been up to and to join in for what we might get up to next. Come become an official member, vote for the office bearers and enjoy wine and cheese! If you would like to see a copy of our Constitution, you are welcome to have a look here. We hope you’ll join us at the AGM! This entry was posted in Community, Event, Take Action and tagged Annual General Meeting, Mechanics Institute, Members night. Bookmark the permalink.